When I saw a Russian diagnostic unit that measures your body’s ultra sonic sound waves via a computer, and then does a complete health check over a period of around 30-minutes, I thought that I had seen everything. But not so, as a very highly qualified doctor of naturopathy, Dr. Kamaljit Singh, who practices in Pattaya and Bangkok, invited me to a demonstration of an even more amazing new piece of technology, which has a wide range of curative capabilities by altering the structure of water within your body. The “Bio-Disc” was invented by New Zealand Doctor Ian Lyons, who after working with NASA for over 25 years, then went to Tibet and discovered why some natural mineral springs are so beneficial to people who drink their waters. After eighteen years he perfected the manufacture of a complex, multiple mineral glass disc that duplicates the benefits of these rare ‘healing waters,’ with scientific ‘nano-technology’ from “Schott” in Germany. When water and other things are passed over the “Bio-Disc” a number of times, the molecular structure is altered; - The tests in which I took part, demonstrated that lemon became sweeter, salt tasted less bitter and water had a different taste, which could be better described as a softer sensation on my tongue. Named the “Amezcua Bio-Disc” this wonderful piece of ‘new age’ technology has been certified by IHM Institute, Japan; PBS Laboratory, Singapore; plus ‘PROGNOS,’ which is NASA’s Diagnostic Company. Like fruit & vegetables, the human body slowly loses molecular chains as it ages, but it can be re-energised at a molecular level by using the “Bio-Disc.” Energized water can be important to wellness, as the molecular restructured water improves hydration & absorbs ion tendencies, thus improving oxygen flow to the blood. This assists in detoxification, reducing free radicals, improving liver functions, plus improved nutrient absorbs ion by your body. “Bio-Disc” is actually allowing you to prepare spring water at home, as natural spring water is the purest form of water known to man, and the miracles of such water have always been astonishing. The “Bio-Disc” energy can be spun into the water in a counter clockwise motion, or any liquid can be poured over the disc, where it picks up the resonance. These resonances are similar to those that are found in the earth surrounding many healing spring waters around the world, and there are fourteen such springs on record around the world. These spring waters have been scientifically proven to have healing qualities, due to higher content of calcium & magnesium salts, plus natural fluorides that encompass a germicidal action. For the mechanism of the human body, there are about thirteen essential minerals, which are listed as macro minerals and trace minerals. Macro minerals are calcium, iron, magnesium, phosphorous and zinc, while the trace minerals are chromium, copper, iodine, manganese, molybdenum, selenium & fluoride. The natural energy of the “Bio-Disc” improves sleep patterns, when placed under your pillow, and also improves the positive “Chi” energy in your body, when a smaller version is carried near your body. It is also known that the “Beta” rhythm frequency spins in an anti-clockwise direction, and like other energy wave forms, it can influence metal objects, just as X-rays can affect conventional film. Likewise, “Beta” rhythms at the correct frequency and spin velocity, can influence liquids. At present scientists cannot understand why liquids behave differently and more positively in an energy field. Much research is now focussed on this, as 70% of our body is made up of water, so it is important to nourish our bodies with water that is of the correct molecular structure. The role of safe drinking water in daily life can be demonstrated by the fact that our blood is 95% water and our brains are 85% water. Ulcer pains, colitis, acidosis, or severe constipation are clear indications of the lack of proper hydration, so it follows that if we can maintain the optimum ph-balance in our digestive system, we will enjoy far better levels of health and energy. When you drink normal water or ‘bound water’ as it is called, it lingers in your cells, often causing water retention and bloating, whereas revitalised “Bio-Disc” restructured water penetrates the cell walls, due to its perfect crystal shape, so it totally hydrates within minutes of being consumed. Water absorbsion is the key-word to maintaining excellent health today, so it does not matter how many supplements you take, or how healthy you think that you eat, if nutrients are not being absorbed into your body and the cell walls. All living beings have a vibrational “Bio” frequency, and a person is certified as deceased when brain waves stop, rather than when their heart stops beating, plus this frequency changes when you are not well. We cannot use blood from a deceased person, because it is devoid of essential ‘life force’ energy! – It is dead! So as Dr. Kamaljit will ask you, - Why do you drink dead water? 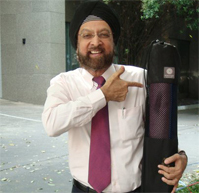 Dr. Kamaljit treats a very wide range of physical and mental disabilities, with his own inventions of electro-magnetic equipment and sophisticated medical techniques, such as the new “Bio-Disc,” which he also distributes as the regional agent.